I travelled to Snowdonia last Friday night. My girlfriend and a friend from her running club were doing the Snowdonia Mararthon, which is a particularly tough route as marathons go, with 975M of elevation as well as some trail sections. One of their friends had pulled out of the event so I was offered his spot in the Snowdon Ranger youth Hostel. I thought I'd just use Snowdonia as a base for some hill training over the weekend and let everyone else get on with the marathon. I arrived late on Friday and had a room to myself. The manager of the place, was a fairly surly chap, not the happiest guy I've ever been greeted by to be honest. Maybe it was the full house and the stress was getting to him! The next morning I got up at 7:30 and was out by 8am. My girlfriend had given me 2kg worth of clothes and food to hang onto during the day, to give to her on the finish line when she completed it. I added a couple more kilo of clothes and water, so had about 5-6kg to carry. It was her first 'road' marathon, so it was a big day for her. She knew the course was tough and has hoping to get in under 4 hours 20. So, I was instructed I had to be waiting on the finish line with the drop bag, on pain of death. So, no tripping around on the hills for 10 hours and forgetting the time then. I did however say that as an extra bonus I'd also run over the pass and meet them in Llanberis for the start. As soon as they were off, I'd hot tail it and run up the Llanberis path to climb up to Snowdon summit (1050m), then run back down the Snowdon Ranger path back to the youth hostel, as the marathon route passed it at 18 miles, then after I saw her I'd run back over the pass to Llanberis again before she got to the finish. This was a fairly tall order;17 miles and about 1600M of ascent, with the added pressure of being 'on the clock'. Turns out the weather wasn't going to allow all of that anyway, however I managed to make up for it. So, I headed out of the Youth Hostel just about 8:15am. Pictures from the train line just above the hostel. It was already raining lightlywith a strong wind down at the youth hostel (150M) and the cloud was down about 3-400M. There is a stiff climb on the Snowdon Ranger Path initially before a fork in the path heads up still to the pass which sits at about 500M. I was wearing waterproofs, jacket and trousers, and some non-waterproof gloves By the time I got up to the highest point I was lost in cloud, with visibility less than 15M and heavy rain. The winds were gale force and the rain was driving horizontal and stinging. The only saving grace was that going North to Llanberis, the wind was blowing from behind me, pushing me up and along. I hopped over a couple of stiles at the top of the pass and started to run down the path to Llanberis about 3 miles away. It was an easy run downhill, just very windy and very wet! It was also very cold with the rain/wind combo. I got to Llanberis about 9:30, so it had only taken me 1 hour and 15 mins to get there. I was however like a drowned rat. I went into the cafe opposite the electric station and paid a hideously expensive price of £7.90 for a fairly poor (both in quality and quantity) breakfast and mug of tea. I should have gone to Pete's Eats like everyone else apparently does on marathon day. I stripped off my 'waterproof's' to find that my clothes underneath were wet. My OMM Kamlieka waterproof jacket had needed re-proofing so I didn't have much sympathy for myself. My gloves were ringing wet, and the OMM waterproof trousers were also suitably sodden but probably would take another another hour before they gave in. I realised I wasn't going to get up to the summit of Snowdon. I didn't have any more waterproofs and well, the winds were gale force. It wouldn't be an enjoyable trip. So, I would have to settle for running back over the pass to the Youth Hostel, but even that prospect I wasn't looking forward to. My girlfriend had only a pertex jacket. I broke out an emergency poncho from my backpack and gave it to her, for all the good it would do. The rain was set in for the day, so all the marathon runners were going to get very wet! Here's the start of the race. Nice weather for ducks eh? I saw one loon running the marathon totally barefoot. 26 miles all on tarmac, with slate and rocks in a few places. Bravado I assume; nothing to be gained but sore feet. Barefoot running on soft ground I can just about 'get' (though I'm still not tempted), but a road marathon, why? I saw her off at the start and then went back into the town and bought a "Mac in a pack" waterproof jacket, which I was assured was quite good and had taped seams. I also bought myself a pair of waterproof mitts, as they were in the sale and I figured I'd get some use out of them over winter, even if they were a bit overkill for today. So, freshly kitted out I headed back up the path and over the hill. This time I was running (before giving up) straight into the gale force wind. I slowed to a walk and leant in to the wind and heavy rain which drove straight into me. I was fairly quickly back into low visibility and wasn't enjoying it one little bit. I had a big run in with bad weather in a storm in Tenerife a few years ago, and I've never quite got over it. I hate being in poor visibility, driving rain and wind when in an unfamiliar location. I had been using a map and compass but pulled out my PDA/GPS which was in a new Aquapac waterproof bag to check my navigation. The Aquapac had saved my life in Tenerife. All my other electronics were destroyed in the storm, but my GPS in the aquapac survived and enabled me to navigate to safety. My girlfriend had recently bought me a new type of Stormproof aquapac, which has a roll top (like a dry bag you put in a rucksack). I didn't realise but you had to roll over the top 3 times, but my PDA was a little too large and I could only roll it over twice. Anyway, water got in and killed my PDA, right at the point where I came to a fork in the path with no visibility. I emailed Aquapac when I got home and they were quickly replied, and I sent back mine for investigation although it's pretty much certain that it must have been not making the seal with 3 rolls that was the cause. They also very kindly sent me the original aquapac model as a replacement, free of charge. This one has twist clips and is fully submersible in water to 5M. It's basically fool (me) proof. Awesome customer care from Aquapac, thank you very much! Anyway, back to the fork in the path. I was a little worries and also getting cold. The mac in a pack had proved itself to be not very waterproof, as my quilted Nike windproof top underneath was wet through. The mac in a pack hadn't even stood up to an hour of the weather. If I would have been out there for another hour or two, I'd probably have gotten very cold and gotten myself into trouble. My waterproof gloves had performed admirably, but were now starting to succumb to the weather too. My hands were toasty and I wasn't likely to get frostbite after all was I! I got out the map, leant into the gale and decided which path I needed to take. I passed a coupe of guys who had not long set off from the Youth Hostel. I tried to ask them if I was on the right path, but we just couldn't hear each other. We went our separate ways but I saw them not long after, as they wisely decided to return to sea level due to the weather. I started to run downhill now, and the path started to look familiar. I breathed a sigh of relief as I exited the cloud and as I run further the wind dropped. I got back to the youth hostel level, where the weather at sea-level was just a very wet and fairly blustery day. I saw the lead runners come past as I headed into the warm and dry of the youth hostel. There was no way I was going back up over that pass to the finish line again, which as pack mule carrying my girlfriends finish line supplies, was a problem. Still on the clock, I stripped off everything I had one. It was all soaked to the core. The waterproof trousers had also given up as well as the mac in a pack. I put on a new pair of running tights, new socks, fleece jumper and left my Kamlieka jacket to dry in the drying room. I had one more dry jacket, but I was saving it in case my girlfriend needed it when she came past. I put on another pair of waterproof trousers, and then cast aside my sodden fell shoes and put on my road running trainers. I realised the only was I was going to be able to be there at the finish was to join the marathon route, stay low in the relatively mild foul weather, and stick to the road. I waited outside the YHA for about 30 mins until she came past. She was soaked to the bone, but didn't want the waterproof jacket I held out as she was warm enough from the running. So, I hastily stuffed it into the backpack, which was still about 5kg and gave chase, caught up with her, and settled into her 9 minute mile marathon target pace, just before mile 18. I think I got a few surprised looks as we passed people and some lunatic in full waterproofs and a large backpack was running past them. I felt a bit guilty and hope they didn't think I had run the whole race, and demoralise anyone. Still, I had already done about 12 miles and climbed about 700M. I probably wasn't too far off in energy spent! The rain persisted but still there were lots of people out supporting the runners. There is a cruel hill from about mile 22 to mile 24, a long gradient which some walk and some run depending on how much they have left. The course really is a tough one. I had some quite severe adductor pain, which has not healed after the 80km race a did last weekend. I was pretty hot wearing all the gear that I did, as well as the pack but just about managed to keep up as she ran up the hill. We slowed up to a walk about half a mile from the top, which gave me chance for a breather before she carried on running all the way down the slippy and treacherous trail section into Llanberis. I've snuck into the official race photography, oops. See the picture below. 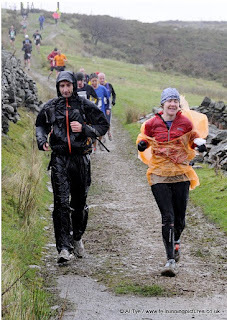 You can see even in waterproofs, which are by then shiny and useless, I was wet through again. A few people fell over, and I just about managed to stay on my feet; road shoes giving me no grip at all. We ran down the hill and into Llanberis where I ducked off the road and onto the pavement and let her carry on through the finish line. She finished in just a few minutes over 4 hours,so she was very happy indeed. Well done! I was on hand to perform my main duty as pack mule, and got out her bag of clean clothes and sorted out some tea and refreshments (in the Electric Station cafe this time). So, apart from a very sore adductor all was well. It may not have been quite the day I was expecting but I had done about 20 miles and over 1000M of ascent, with some excitement and several changed of clothes to boot! The following morning, the weather was much improved at sea-level and the cloud was up to about 600M. I set off alone on the Snowdon Range Path with the aim to climb Snowdon again. I did do some running but my adductor was sore, and really concerning me. The path gets much steeper on loose rocks and slate. I got up into the cloud where the winds were touching gale force again, low vis and fairly miserable. I climbed up to 850 metres, about 1.5k from the summit, but at that point considered my options. I'd done most of the climbing and was worried that I could be doing more damage to the adductor if I did a big day out again. It was also miserably cold and windy where I was, and no visibility, so no reward for reaching the summit anyway. So, decision made a run and walked back down to the YHA. I took a few pictures once I got back under the cloud. This week I've had several massage treatments to try and settle the adductor. I've not done any running. I've walked into work with my pack a couple of times and done some passive sessions on the altitude machine. This means I sit still but breath in air at 6500M. It makes you very sleepy as the oxygen sats plummet towards 70%. I've been advised not to run this weekend either. It's very frustrating as I should be peaking my training, but I'm wise enough to know when to back off. Next weekend's 26 miles Six Dales Circuit is very much in jeopardy too, as that's just 3 days before I fly to Nepal. The adductor issue is worryingly the opposite side to my other groin problem, which is also problematic at the moment too. I've just got to hope that 10 days rest is going to sort things out. This weekend I'll have to do my packing for Nepal, so I'll update about that next week. Have a good week! Hi Rich, I know it's frustrating but probably better to rest as much as possible- you have got the training 'in the bag' for Nepal so I don't think you will lose much fitness. Nepal will be a fantastic experience- I must admit to being a wee bit jealous!! That explains a lot, Rich (great story, BTW). I recall seeing a waterproof-clad bloke with rucksack get himself sorted out on my left as I passed, then overtake me, running with no number. I knew there had to be a valid explanation. Well done to you and to your girlfriend. You both beat me. I'm registered for Six Dales Circuit. I hope you're able to make it (though I wouldn't recognise you if you were there). Nick. How funny that you saw us. I'm not sure if beating you is very accurate when I only hopped in at mile 18! I did feel a fraud as I ran along with people clapping. If I do the Six Dales I'll be sure to say hi. We've spoken before but it was at least years Kipling Caper when you'd broken your foot. I may go along just to say hello to Anne and Vaughan and cheer my girlfriend on, as she's doing it even if I can't. Steph, It is really frustrating. My physio friend has given me some treatment and ultrasound today and also told me not to run before the event. I really should be peaking my fitness, but I'm not going to do anything silly. Six Dales is looking unlikely, but we'll see. Hi Rich, I guess it would be such a shame to injure yourself at this stage- just play it by ear but I don't personally think you will lose much but not running. Injuries are so frustrating- I have a knee problem at the moment which has put paid to the Brecon Beacons Ultra; we know we should rest but it's so difficult to do! !